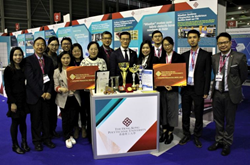 The Hong Kong Polytechnic University (PolyU) was among the big winners in the Hong Kong delegation this year at the 47th International Exhibition of Inventions of Geneva (Geneva Inventions Expo), the exhibition regarded as the most important specialist event of its kind in the world. Among the nine Grand Awards Hong Kong delegation took home, PolyU was awarded four of them. PolyU garnered 18 awards altogether, including four Grand Awards, two Gold Medals with the Congratulations of Jury, three Gold Medals, two Silver Medals, and seven Special Merit Awards.